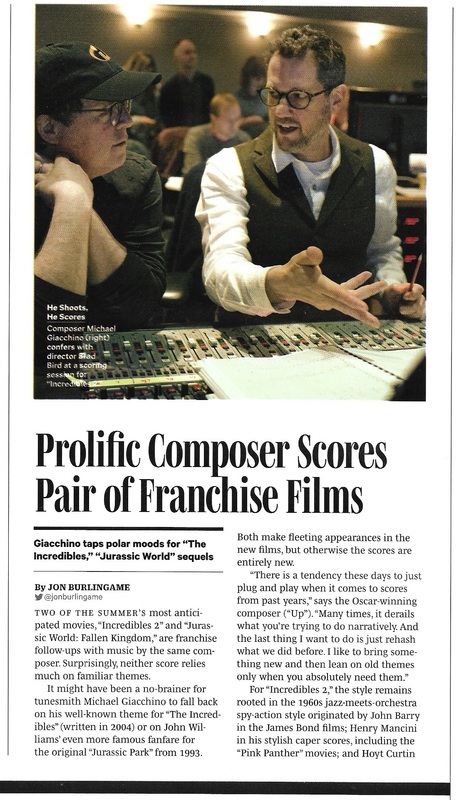 Prolific, award-winning composer Michael Giacchino went in two directions at once this spring — boisterous fun for The Incredibles 2, dark and scary for Jurassic World: Fallen Kingdom, films that are currently dominating the American box office. I visited the recording sessions for Incredibles and then talked to the composer about writing two big scores back-to-back for major film franchises. It was also an opportunity to discuss his latest concert work, celebrating the 60th anniversary of NASA, June 1 with the National Symphony Orchestra in Washington, D.C. This entry was posted in Composers, Film Music, Interviews and tagged Incredibles 2, Jurassic World Fallen Kingdom, Michael Giacchino, NASA 60th, National Symphony Orchestra, Variety, Voyages on June 12, 2018 by Jon Burlingame.